Come play and stay in this beautiful home located in the heart of Garden City. Nestled on the hillside for amazing view of Bear Lake. 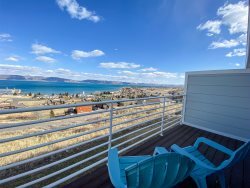 Enjoy playing basketball, volleyball or games on the large green space while taking in the breathtaking views of Bear Lake. Completely update with new paint, flooring, fixtures, funiture, bedding and more! Free WiFi and lots of room to play! !